Melrose, MA, then revived in San Francisco, CA. Publisher: M.J. Clarkson. Editor: M.J. Clarkson and Lida Clarkson, associate editor. 1/1, August 1894-5/1, August 1898. 8 1/2 x 11. $1.00 a year, 4-16 pp. The journal succeeded the editors' earlier, smaller journal called Silent Circle. In 1902 M.J. Clarkson was advertising in the New Man a journal of the same name published in San Francisco. A pure affective "New Thought" journal, largely written by "M.J.C." and filled with cheerful "Helps to Right Living" ("Let us dare to think. Let us dare to be.") and the like. The title of one of her books, advertised in the journal, tells it all: The Secret of Successful Healing and Habit of Inner Quiet. 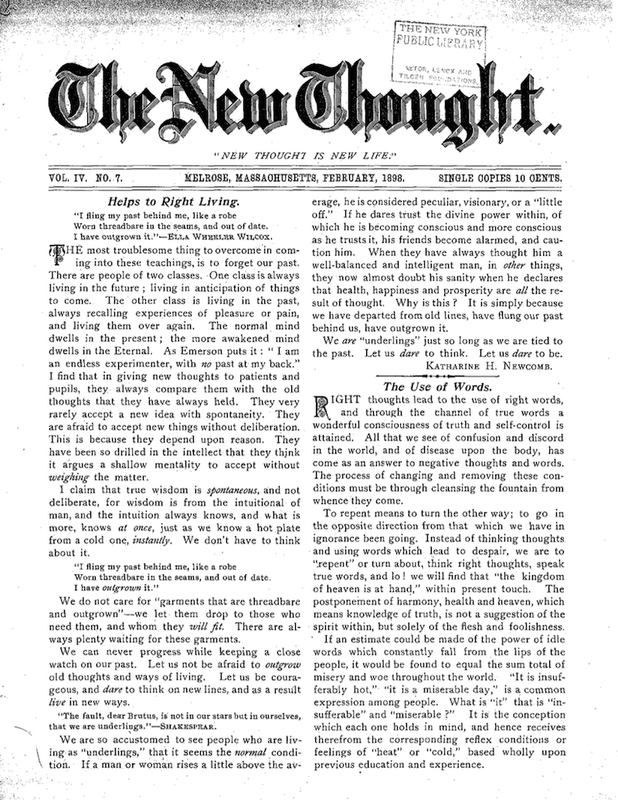 New Thought for Clarkson and the journal general, despite an occasional venture into "Immortality in the Flesh," was a matter of peace, harmony, rest, inner calm, and healing, in stark contrast to the more magical version of New Thought promulgated by the journal's later namesake in Chicago. Each issue had a Thought (for example, "My supply is unfailing because the resources of the universe are mine") for the Silent Hour to be held in Silent Circles held every month. Three and a half pages of advertisements for Ralph Waldo Trine, W.J. Colville, Helen Wilmans, Parsival Braun's New Man and Der Meister, and other New Thought journals, and for what appears to have been a common New Thought development of the end of the century--sanitariums where New Thought devotees could practice the sense of interior silence. (The Clarksons ran one in Upstate New York and another in California.) Julius Dresser, The True History of Mental Science (New York, Alliance Publishing Co., c. 1899) notes this as the first journal to take the title The New Thought (as the new movement sought to distinguish itself from Mary Baker Eddy's Christian Science and still distinguish their movement from the old (theological) views, but this journal was preceded by half a decade by Moses Hull's spiritualist journal of the same name. Occasional contributions by Eliza Calvert Hall, Flora P. Howards, Anne Dexter, William E. Towne, and others. NYPL.iews, but this journal was preceded by half a decade by Moses Hull’s spiritualist journal of the same name. Occasional contributions by Eliza Calvert Hall, Flora P. Howards, Anne Dexter, William E. Towne, and others. NYPL.